Chesley Fence & Deck is proud to provide decorative fencing for homeowners in Belleville, Illinois, and throughout the Metro East area. As a leading installer of top-quality fencing in the region, we understand the unique needs and preferences of local residents, and we offer a variety of beautiful fencing to accommodate their requirements. One popular decorative fencing option that we offer in Belleville, IL, is our ornamental aluminum fencing. This product is exceptionally durable and attractive, as it is available in numerous styles and colors and protected by an 11-step powder-coating process to prevent peeling and chipping. It also can be fitted with accessories, such as scrolls and finials, allowing homeowners to truly make their fencing their own. Plus, it is designed with screw-less panels, and hidden rivets and screws to achieve a truly seamless appearance. To provide homeowners with peace of mind that they’re making a worthwhile investment, our aluminum fencing is backed by a lifetime warranty. 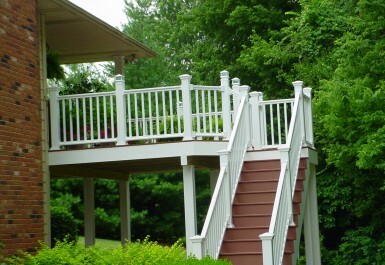 If you’d like to learn more about the decorative fencing that we install in Belleville, IL, contact Chesley Fence & Deck today. In addition to aluminum, we offer premium vinyl and Western Red Cedar fences in many different styles.